Vicki is a UK-based health development professional, with more than 20 years experience of working in research, education, management and consultancy. She has designed, delivered and evaluated health projects and programmes for community, district, regional and national health systems in sub-Saharan Africa, Asia and Latin America working with government, UN agencies, global health partnerships, research institutions, consultancy companies and NGOs. She has been a member of technical and management advisory groups on several large multi-million pound DFID funded technical assistance programmes, providing guidance in relation to her core areas of expertise which include health systems strengthening, quality improvement in health care, strategic planning, capacity development and evaluation of health programmes. Her research and consultancy work has resulted in a range of publications including global guidance and national strategy documents, policy briefs, training manuals, book chapters and journal articles. She has extensive experience in the development of context specific healthcare quality assurance systems and has delivered institutional capacity strengthening programmes across the developing world. She has considerable experience in strategic and operational planning and has supported the strategic planning process for a range of institutions including GAVI, MoH Bhutan, National AIDS Control Programmes in Kenya and Namibia and the European Esther Alliance (EEA). 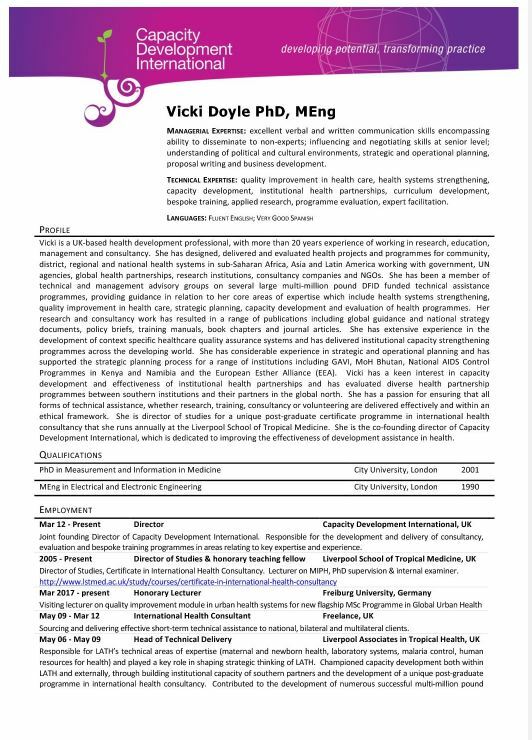 Vicki has a keen interest in capacity development and effectiveness of institutional health partnerships and has evaluated diverse health partnership programmes between southern institutions and their partners in the global north. She has a passion for ensuring that all forms of technical assistance, whether research, training, consultancy or volunteering are delivered effectively and within an ethical framework. She is director of studies for a unique post-graduate certificate programme in international health consultancy that she runs annually at the Liverpool School of Tropical Medicine. She is the co-founding director of Capacity Development International, which is dedicated to improving the effectiveness of development assistance in health.